With the huge box office success in 2017 of IT, movie adaptations or remakes of horror master Stephen King’s works are in fashion and the trend is showing no sign of slowing down. IT: CHAPTER TWO is expected to hit our cinema screens on September 6, and six other King works are either in development or post-production. With over 70 novels and 200 short stories to his canon, there is plenty for screenwriters to choose from. 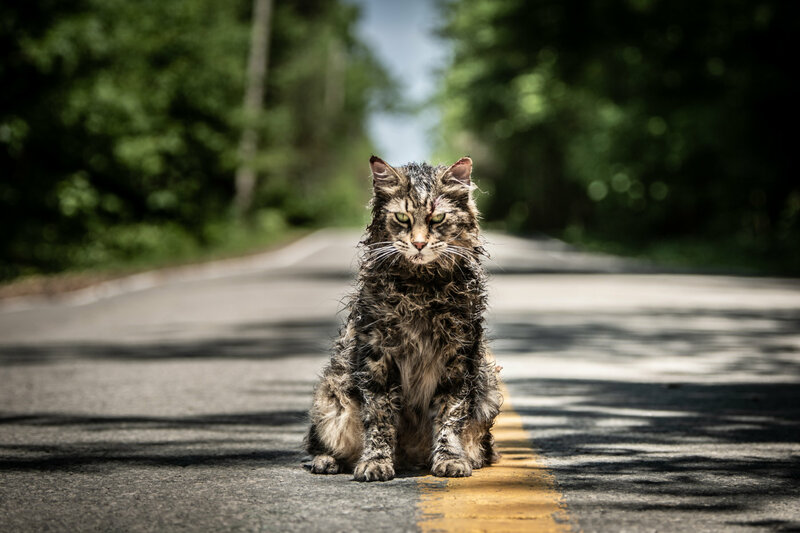 The remake of what is possibly King’s scariest book, PET SEMATARY, has just arrived but how does it shape up to its 1989 predecessor? In this adaptation, Louis Creed (Jason Clarke, FIRST MAN; TERMINATOR GENISYS) is an ER doctor who gives up his graveyard shift (haha) work schedule in Boston for a quieter life in Ludlow, Maine. He, his wife Rachel (Amy Seimetz, LEAN ON PETE; ALIEN: COVENANT) and their kids, 8-year-old Ellie (Jeté Laurence) and toddler Gage move into a homey, ranch-style house on the town’s outskirts, and before they’ve even finished unpacking all their boxes, Louis has to deal with the grizzly death of student Victor Pascow (Obssa Ahmed) at his university clinic. Meanwhile, Ellie discovers that behind their home lies a pet cemetery (misspelled “sematary”) that the townsfolk have been using for hundreds of years. It’s during that outing that Ellie meets their neighbour, Jud Crandall (John Lithgow, LOVE IS STRANGE; TV’s DEXTER and 3RD ROCK FROM THE SUN), a widower who has lived in Ludlow all his life. After Ellie’s pet cat, Church, is killed, Jud takes Louis to a swampy area just past the cemetery and tells him to bury the cat there. Much to the family’s surprise, Church is back the next day but he’s changed into a mangy mess with severe anger management issues. At Ellie’s birthday party some time later, tragedy strikes the Creed family again. Louis decides they’re not ready to part with their beloved child yet and he makes plans to exhume the body from the church graveyard and rebury it in that mysterious area behind his home. Jud figures out what Louis plans to do and warns him not to but it’s too late. The next morning their child is back but has changed as well. That’s when things really start to get messy for the Creeds. The vast majority of critics are loving this adaptation, saying that it’s even better than the original. I’m not one of them though. To be fair, there is a fair amount that’s good (such as the performances, particularly by young Laurence, and the lean, 97-minute running time) but there’s just as much that’s downright cheesy. Storywriter Matt Greenberg (HALLOWEEN H20: 20 YEARS LATER) has updated King’s original story and screenplay and, for the most part, it works until it doesn’t. The biggest problem is Louis’ character, who is now the rational one of the family. You would think that someone like that would have been meticulous in his research before buying that home. Not only does it include an ancient burial ground that the whole town — and the Internet, apparently — knows about but it also fronts onto a highway that sees a steady stream of large trucks speed by. You’ve got a toddler running around, FGS! Put up a fence! And about that running time, I rarely say this but I think the film could have been about ten minutes longer. In this version, we’re given some insight into Rachel’s irrational fear of death, a storyline that was excised from the 1989 film, but I would have preferred to see a few more minutes spent on that subject. Louis’ online research into the ancient burial ground and Jud’s late wife’s story are equally too brief. The film is directed by Kevin Kölsch and Dennis Widmyer, who have worked together on a few horror-thriller movie and TV productions in the past. Unfortunately, they don’t bring anything new to the table here, relying instead on the typical genre tropes that include flickering lightbulbs, a dark basement, rolling fog and characters who like to sneak up behind others. If jump scares are your thing, there are plenty of them in this film. There is also plenty of stilted dialogue that will elicit laughter for all the wrong reasons. That being said, PET SEMATARY is not even close to being a trainwreck and it’s debatable as to which version is better. Many will say this one is; others will say that the 1989 one is. One thing everyone should agree on though: It’s nowhere near as well made or as enjoyably terrifying as the IT remake was.